This election has not been short of surprises, and the stock market is no exception. With the Dow and S&P 500 reaching record highs on Wednesday, it seems the market has recovered from the uncertainty we had just one month ago. That said, the President-elect doesn't step into the White House for another month and a half. It's to be determined if we see another shift after January 20th once the the rubber hits the pavement. Until then, Trump has shared (some of) his plan as president, and as he appoints his administration, the market will adjust. Based on what we know, we expect the impact to be a mixed bag for tech companies and their IPO plans during the Trump presidency. Trump is a business and deals guy, and whether that's good or bad for our President, some of his policies reflect this and the market is currently liking it. Primarily, Trump plans to lower corporate taxes from the standard 35% to 15%. This will certainly help the tech sector broadly as it will boost their bottom line. This could help smaller companies who may have been boxed out of IPOs previously due to their size hit the markets earlier in their life cycle. Larger tech companies usually have a lower effective tax rate (typically in the range of 19% to 26%, which is below the 28.6% S&P average) thanks to tax harbors by keeping cash abroad. In any case, the proposed 15% corporate tax rate is a win. Furthermore, Trump wants to bring foreign cash home to spur US jobs with a 10% tax for the repatriation of foreign cash. It's widely discussed that Apple alone has a whopping $200B in cash abroad. This move would spur hiring in the US along with M&A and R&D activity. Finally, Trump has been pretty outspoken about financial reform after the 2008 recession (Volcker rule, Dodd Frank...) and repealing parts of this would open up financial institutions to taking more risk on their balance sheet, which may include tech investments. Sticking to his word to bring many jobs back to the US, Trump wants to place tariffs on goods made abroad to encourage US manufacturing. This will increase consumer costs and impact inflation, and ultimately hurt US companies. In return, this move could also hurt US exports to companies in countries who were impacted by the loss of US manufacturing abroad. On a related note, Trump's outspoken plans for immigration reform have a more direct impact to tech companies as it will make it harder for them to hire top talent. Google, Apple, Amazon, Oracle, Intel, and Microsoft are among the top 25 applicants for H1B visas each year. Furthermore, according to a recent study by the National Foundation for American Policy, more than 50% of private tech companies in the US valued over $1B have at least one immigrant co-founder. Lastly, Trump has a bone to pick with the Affordable Care Act (colloquially known as Obamacare). His recent appointment of Tom Price as secretary of Health and Human Services seems to reconfirm what he said on the campaign trail (for the uninitiated, Obamacare gave birth to a slew of healthcare startups that were built specifically for it). IPOs have a phobia of volatility and uncertainty, and Trump's healthcare plans are exactly that: volatile and uncertain. In aggregate, the consensus seems to be net positive for tech companies (aside from healthcare: sorry guys), given the administration's policies toward economic growth. The big question is: how pro-technology will Trump actually be? So what does this mean for tech IPOs under Trump? 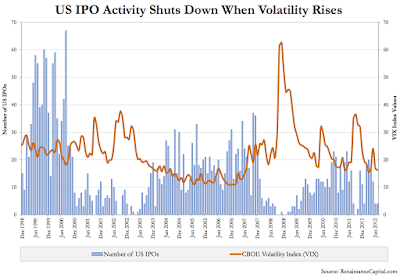 However, IPO filing activity has remained steady since the election as shown in the chart below by Renaissance Capital. We have little IPO data to analyze, but the equity markets have performed well since Trump's election, which is encouraging for any company who wants to take their company public. However, it's important to consider that the IPO market usually operates on a very case-by-case basis. Just like private companies raise money when they need it, companies seek an IPO when it's right for them - whether they need the cash for operations or liquidity for their shareholders. There's often an added strategic element such as getting out ahead of competitors (like HortonWorks did ahead of Cloudera and MapR), or waiting for regulatory issues to conclude (see: Uber and Airbnb). In the current market, if a company wants to IPO, it is probably a good time to continue on that path. One thing the IPO market doesn't like is volatility, so we may see another market shift from election day once the Trump administration takes the wheel January 20th and changes direction.